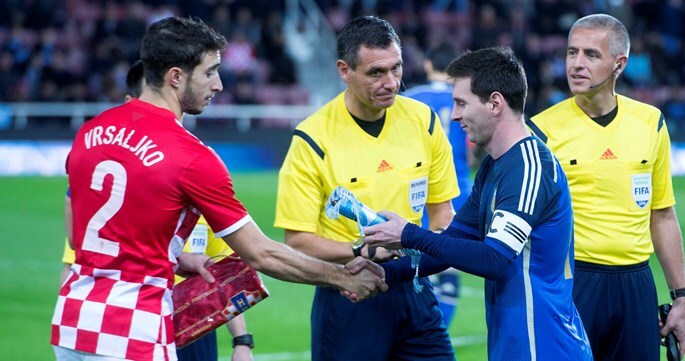 The friendly international at London's Boleyn Ground ended in Argentina victory, although aggressive Croatia took an early lead. Croatia: Kalinić (89' Vargić), Vrsaljko, Jedvaj, Lešković (84' Mitrović), Leovac, Antolić, Badelj, Milić (71' Tomečak), Kovačić (46' Halilović), Sharbini (65' Jajalo), Čop (84' Rog). Head coach: N. Kovač. Argentina: Romero, Zabaleta, Fazio, Vergini, Ansaldi (76' Silva), Mascherano, Banega (70' Pereyra), Perez, Di Maria (76' Lamela), Messi, Aguero (62' Tevez). Head coach: G. Martino. 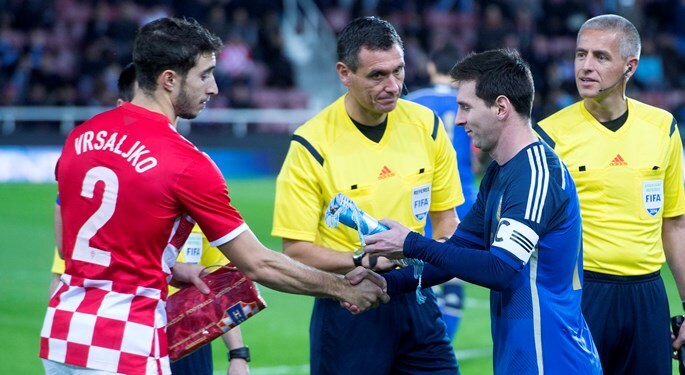 West Ham's ground hosted the international friendly between full-squad World Cup runner-up and Croatia national team without some of the major stars, yet Croatia managed to offer quality resistance and presented very high level of play. Croatia's undaunted opening minutes were rewarded in the 11th minute, when Mateo Kovačić found Anas Sharbini, who put the ball behind Sergio Romero with a neat touch to give Croatia a valuable lead and an additional injection of self-confidence. Even though Argentina had more chances in the remaining minutes of the first half, Croatia showed quality and enough dynamics to hold on and wait to strike on counterattack. Lovre Kalinić was comfortable in goal, with a couple of fine interventions after Aguero, Di Maria and Messi strikes, while Aguero and Messi shot wide in two promising opportunities. However, Argentina scored the equalizer in the opening minutes of the second half. Cristian Ansaldi struck from distance, and the ball bounced off Sergio Aguero to find the way past Croatian goalkeeper. Under a ten minutes later, Messi sent an excellent through ball to Aguero, and Kalinić rushed out only to clip the Argentina striker in the box. Barcelona and Argentina number ten had no trouble in scoring from the penalty spot. Afterwards, Carlos Tevez missed a golden opportunity, while Messi hit the woodwork ten minutes from time. Croatia head coach Niko Kovač introduced Halilović, Jajalo, Tomečak, Rog, Mitrović and Vargić in the second half and waits to decide on the players from the London delegation that will represent Croatia at the San Siro, in a European qualifier against Italy on Sunday.